In my post of July 16, I shared the beginning of the story pieced together by Connie Jo Bowman in 1994, when she interviewed my grandfather Adrian Zuidweg. Here is the next part. Today I am going to focus on just one paragraph–to try to unpack it. His father owned a fish market and Adrian’s earliest memories were of going to his aunt’s house while his mother helped out at the market. He remembers playing with his cousins around the big woodburning stove and the “outside toilet.” This was before 1911 because that was the year gas and sewer lines were brought up the street to their house. I’ve written before about Grandpa’s father’s fish market in the post “My Great-Grandfather Reinvented Himself as a Business Owner in the U.S.” I share photos in that post of the interior of the fish market and the interior of the ice cream parlor Adriaan Zuijdweg (Grandpa’s father) owned after the fish market. So that’s where Grandpa’s mother Cora went to “help out” at the market. But Grandpa himself stayed at his aunt’s. There are two possibilities. One is his Aunt Jen, Cora’s sister. The other is his Aunt Johanna, his father’s sister. Before 1911, Grandpa was a toddler–maybe two years old. Some people don’t have memories from that age, but I also have memories from when I was two years old. Let’s say the year was 1910. In 1910, Johanna Zuijdweg Van Liere had been in the United States for six years. She married her husband Marinus Van Liere in Goes, the town in the Netherlands they were both from. 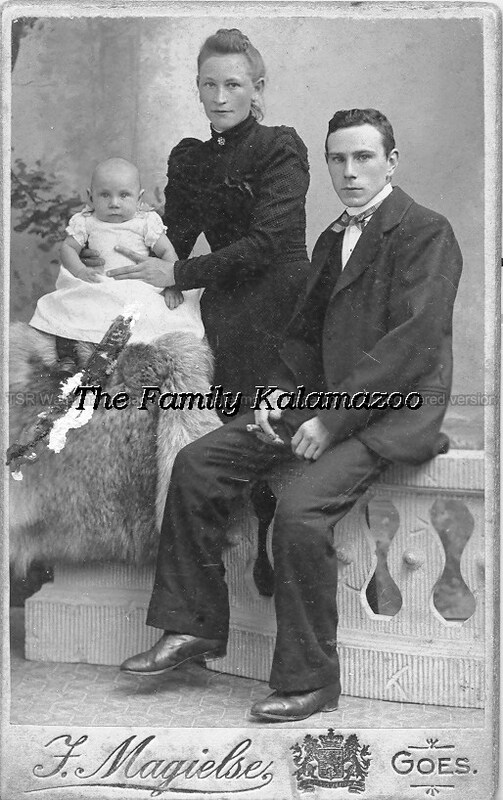 Johanna had two baby boys when she immigrated here, and by 1910 may have had six, seven, or eight boys. I’m not sure if they all survived infancy, but she was evidently quite busy. Grandpa’s mother’s sister Jen, on the other hand, had one 13-year-old daughter in 1910. If Grandpa played with his cousins around the stove and the outhouse in the yard, it would be Johanna’s children. This led to me to search out where Johanna and Marinus were living in 1910. The 1910 U.S. Census shows Grandpa living with both his parents, Adriaan and Cora, his grandfather Richard DeKorn, and his uncle Joseph DeKorn in the Richard DeKorn house at the corner of Burdick and Balch: 1324 S. Burdick Street. Since the house still stands today, if it wasn’t moved, the address numbers have been changed on Burdick. The VanLieres, Johanna and Marinus, and their six boys lived at 1338 S. Burdick Street. It looks like another family lived between them. About four houses down from the VanLieres lived John and Mary DeSmit and their children. Mary DeSmit was Richard DeKorn’s sister. I found it interesting that the census shows Johanna and Marinus speaking English, although they had only been in this country for six years. A few of the neighbors spoke Dutch, but most of them spoke English. In this section of Grandpa’s story, he remembers that gas and sewer lines were brought up to their house in 1911. It must have made a monumental difference in the quality of their lives. Because his grandfather, Richard DeKorn, was a building contractor, would they have been quicker to get connected or was it something they had to wait their turn for, like everybody else? On a personal note, I was surprised that Grandpa’s family was as close with his father’s sister and her family as this research shows. I knew that the family was often with Aunt Jen, as many of the family photos are of Jen and her husband Lou. But there aren’t as many photos of Johanna, nor do I know the history of that branch of the family as the children all grew up. 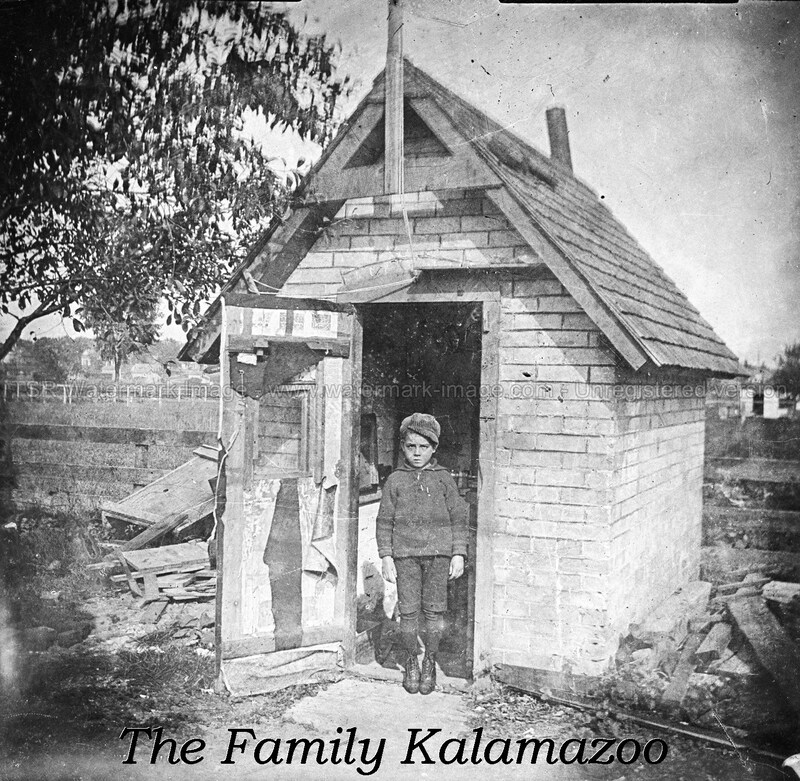 I hope you’ll stay tuned for Part III of Grandpa’s story . . . .
I’m thinking shed – not outhouse. Not for sure, though. Our outhouse in Texas wasn’t nearly so elaborate. 🙂 Incredible pictures today. Sheila, it looks elaborate, but also really messy, doesn’t it? That pic really intrigues me. I wonder what in the world it was and what the boy was doing and thinking. 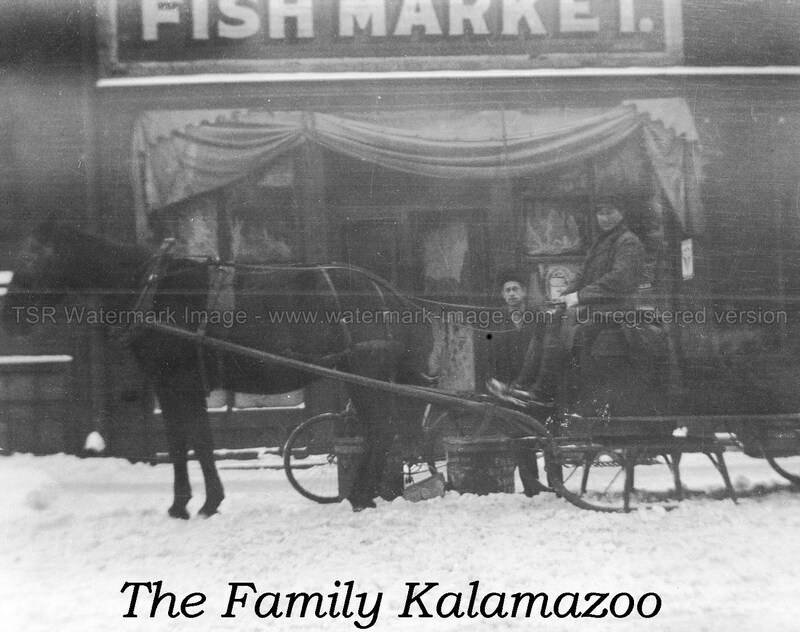 And the fish market pic takes me there, feeling what it was like to live that way in the snow. I think that family members helped each other out more years ago than they do now. My father had a great aunt who was single–and when he was a child when he got sick he was sometimes sent to her home for several days to recuperate in peace and quiet. Sheryl, ooh, I like that. For some reason, it reminds me of Jo in Little Women staying with the older relative to read to her! Interesting how you pull together so many details to form a portrait(s). I wonder how they got the baby to sit still for one of those old photos that take so long?! The more info I find the more I realize how much I had at my fingertips that hadn’t been put together. I was thinking about that–about the sitting still for these pix! I can’t imagine how any of the pix turned out this good! And for the baby yes. Unimaginable. And a few pix have dogs . . . . This is a fabulous post; I so adore those photos. Thanks, GP! I do too. Such amazing details in them, and the one of the fish market has a lot of atmosphere, like a movie still.